One of the most dangerous types of car accidents that anyone can be involved in is a rollover accident. It accounts for near 30 percent of all vehicle fatalities annually. If you have been injured in this type of wreck, the Austin rollover car accident lawyers at Zinda Law Group can help. Although larger vehicles are more prone to being involved in rollovers, smaller vehicles are not immune. In this type of accident, the vehicle does not have to completely roll over, but can also roll onto its side or roof. Many of these accidents are so severe that the car rolls over multiple times. To get help today, call Zinda Law Group at (800) 863-5312 for a 100% free case evaluation from our Austin rollover car accident attorneys. Typically, these types of accidents start when a vehicle is traveling too fast while turning. If you were the non-liable party in a rollover accident though, then there is likely a different cause. You may actually have a case of auto product liability if you were involved in a rollover, because some vehicles have been tested to be more prone to these types of accidents because of a defect in the design. One major cause of rollovers is a phenomenon called "tripping." Like it sounds, this occurs when a vehicle gets tripped up on an object on the road. This can be something as small as a curb or something as large as another vehicle. What can commonly happen is one driver will swerve to avoid an accident or a car that is driving recklessly. If traveling on a high-speed road such as a freeway or a highway, then a sharp swerve can result in the entire vehicle tipping onto its side or rolling over. The weight of the vehicle makes it difficult at times to rescue victims from these types of accidents. A fairly common occurrence when it comes to rollover accidents is roof crush. When a vehicle rolls over, it needs to have a strong enough roof to support the weight of the rest of the vehicle. If it does not, then the roof of the car will cave in and severely injure the passengers inside. Vehicles are rated by their roof crush strength, which has been rated by the Insurance Institute for Highway Safety. Because nearly 10,000 people are killed every year in rollover accidents, vehicles are now coming with stronger roofs. To meet federal regulations for strength, vehicles must have a 1.5 strength-to-weight ratio. Unfortunately, this is not strong enough to prevent many injuries in rollover accidents. If all vehicles had a ratio of 4.0, there would be 50 percent less serious and fatal injuries as a result of roof crush. Victims of these accidents are injured more severely than those who simply hit their heads inside vehicles in other accidents. This is because while the passengers are traveling toward the roof, the roof is simultaneously traveling toward them as it is being crushed by the pavement. This increases the force of the impact. If roof crush has injured you or your family, it is in your best interest to contact our Austin car accident lawyers for free legal advice. If you were injured in a car accident because your vehicle rolled over, then you may have a claim against another driver or against the manufacturer of your vehicle. The best way to find out what you may be entitled to is to contact a Personal Injury attorney from our firm. You may actually be struggling to prove liability in your incident. Chances are, the other driver who was involved in your accident (if any) has an insurance company that is trying to shift the blame as much as possible in order to avoid making a larger payment for your injuries and vehicle repair. 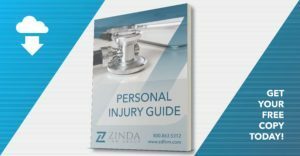 Zinda Law Group can help you fight to ensure that you maximize your recovery. For more information, call us today at (800) 863-5312 for a 100% free consultation with our Austin rollover car accident lawyers.